Today’s Text: Psalm 145:18 The LORD is near to all who call on him, to all who call on him in truth. Busy doesn’t begin to describe what life is like right now. The activity of church life and personal life has captured not only every spare moment of time but also every resource of human strength. I fell asleep last night on the couch at 7:30! Add to that the number of great people who are passionate about using their gifts to serve Jesus and are inviting me into their ministries, and I’m overwhelmed. I hope they understand when I have to say no and that it’s not a statement of disinterest in or non-support of what they are doing. God has connected all of us in the Body of Christ, the church, with unique passions and gifts and when we are all doing our part it brings glory to Him. We don’t all do the same things, but we are all connected and growing into the stature of the fullness of Christ. This morning the Lord helped me to understand my specific need right now by leading me to several verses that helped me re-focus my heart and mind on His purpose for my life and how to handle all the activity that surrounds me. Psalm 34:18 — The LORD is near to the brokenhearted and saves the crushed in spirit. Psalm 46:1 — God is our refuge and strength, a very present help in trouble. James 4:8 — Draw near to God, and he will draw near to you. Jeremiah 29:12-13 — Then you will call upon me and come and pray to me, and I will hear you. You will seek me and find me, when you seek me with all your heart. Psalm 145:18 – The LORD is near to all who call on him, to all who call on him in truth. I discovered that I was doing most of this in my own strength, exhausting myself with a to-do list and ignoring my time with Jesus. I was more concerned about working for Him than resting in Him. As a result, I began to see people who were demanding things from me as “pains” rather than “partners.” I began to focus on the external negatives of their behavior rather than the humble condition of their heart. I formed opinions about their motives. I began to blame myself for not having more energy or more time to do what they wanted. I began to believe the lie of the Enemy that I was no longer spiritual enough because I didn’t do everything they needed. Then this morning I fell into the arms of Jesus and rested. He assured me that I was right where He needed me to be so that His grace could take over. He assured me that I am just one small piece of His body the church and that not everyone is called to be passionate about the same thing, except to love Him and love others. I knew I was not focused on love, but on labor, and He assured me that He wasn’t. He loves me. He will use me if I love Him. That’s all I need to know. Be Thou, O Rock of Ages, nigh! As clouds before the mid-day sun. Take courage. Often turn to the Lord, who is watching you, poor frail little being as you are, amid your labors and distractions. He enables you to bear your troubles patiently and gently, for love of Him who only allows you to be tried for your own good. Raise your heart continually to God, seek His aid, and let the foundation stone of your consolation be your happiness in being His. All trouble and annoyances will be comparatively unimportant while you know that you have such a Friend, such a Stay, such a Refuge. Today’s Text: Isaiah 59:1-2 (ESV) Behold, the LORD’s hand is not shortened, that it cannot save, or his ear dull, that it cannot hear; 2 but your iniquities have made a separation between you and your God, and your sins have hidden his face from you so that he does not hear. Last March during severe blizzards in Japan, a father froze to death while sheltering his daughter. Mikio Okada died as he tried to protect his only child, Natsune, against winds of up to 68 miles per hour and temperatures that plunged as low as 21 degrees, making for windchills of 10 below zero. Mr. Okada called his relatives to say that he was stranded and that he and Natsune would try to walk to their destination. But they were both found just 300 yards from the truck. Mr. Okada was reportedly found hunched over his daughter, cradling her in his arms and apparently using his body and a warehouse wall to provide shelter. He had taken off his jacket to give to the child. The young girl was taken to a hospital near their home where she was found to have no serious injuries. But the principle that sticks out to me this morning is this – God is able to save us if we will stay within His reach. No matter what our situation or circumstances, God has not moved away to become simply an observer from a distant vantage point. If there is an apparent distance between us and God it is because we have moved, not Him. His arm has not been shortened. His ears have not become dull so that He cannot hear our cries for help. The problem is not with God, who never changes, but with us because we change all the time. We change our minds about whether or not we can trust God and His Word. 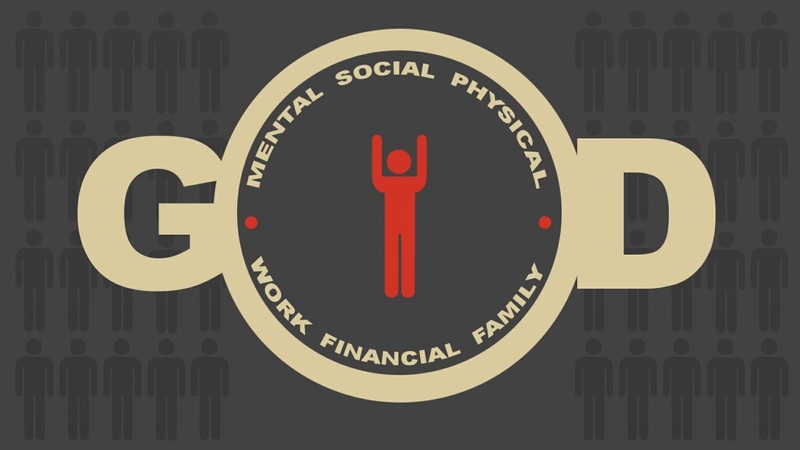 We change our minds about whether we will obey Him or follow our own personal plan of performance. We make choices every day to love Him and then turn around and love ourselves more. But what we may not consider as we think about those choices is that every choice we make to leave God out of individual moments in our lives makes us responsible for the outcome of those choices. God made a choice to love us and reach out to us in His Son Jesus Christ. His choice will never change. God also made a choice that those who reject Jesus will suffer severe consequences, not only in this life but in eternity. That choice will also never change. Our choices either bring us into the arms of Jesus for protection against all the storms of life, or they move us away from God’s protection and make us vulnerable to the storms of life. God has put Himself between you and the storm of sin. He has offered to save you from the storm, not so much by wrapping you up but rather by filling you up with the eternal warmth of His love. His Holy Spirit, dwelling in all who have repented of their sin and have run into His arms for forgiveness, provides a constant fire of holiness within us. Never again do our hearts need to grow cold. Never again do we need to fear being out of reach of the arms of God. He is in us, and His love never changes. If you feel distant from God today, it is not because He has moved – you have. Run to Him, and discover that the fire of salvation is still blazing, and it will never be extinguished. After two dozen incorrect guesses, I finally revealed the answer. The life of Jonathan, King Saul’s son and King David’s best friend, has always deeply touched my heart with its principles of friendship and love. Two of the three principles of a good friend I shared last night are still on my mind this morning. As Saul’s son, Jonathan was next in line for the throne of Israel. He became a mighty warrior, but even in his military success he was learning an important principle of friendship and success – do your best without concern for who gets the credit. Jonathan had just won an incredible battle with only a few men, and yet his dad the King took all the credit. Former United States President John F. Kennedy said, “There’s no limit to what a man can accomplish if he doesn’t care who gets the credit.” Too many friendships are ruined by a self-exalting competitive spirit that seeks honor and recognition for everything done. This was not Jonathan’s way, as we will see. Through the course of his reign, Saul became disobedient to God and his Kingdom was taken from him. Without Saul’s knowledge, David was anointed as the next King of Israel. This is utterly amazing. Jonathan had every right to be angry with his father for messing up his future. His chance to be King was gone. GONE! And now, standing in front of him, was the young man who would be king; the one who would get all the honor and recognition that could have been his. OUCH! Yet notice the Spirit of God in Jonathan’s heart. He chooses to love David rather than hate him. He chooses to put action to his love and stripped himself of the robe that was on him and gave it to David, and his armor, and even his sword and his bow and his belt. 5 And David went out and was successful wherever Saul sent him, so that Saul set him over the men of war. And this was good in the sight of all the people and also in the sight of Saul’s servants. (1 Samuel 18:4-5). David took the very position that Jonathan had held, and Jonathan helped him get it. Jonathan showed no anger toward the person who took his job and his title. Instead, Jonathan came along side David and assisted his success. That’s what true friends do. After I was done speaking last night, one of the AWANA Commanders came forward to give the students the evening’s results of the ongoing missionary offering contest. One of the teams had taken a huge lead over the other. He asked the team that was behind to cheer for the team that was ahead. The response was not good. I actually heard booing. I guess I need to tell the story over again. But before I do, I’d better make sure I’m cheering others who are getting ahead of me, especially those times when I think I deserve to get ahead. Today’s Text: Psalm 51:2, 7 2 Wash me thoroughly from my iniquity, and cleanse me from my sin! 7 Purge me with hyssop, and I shall be clean; wash me, and I shall be whiter than snow. There is a word that has captivated my thought life since last week. I sincerely have used this word in every prayer I have spoken to my Lord since I believe He gave it to me as a word picture that I needed. I am certain that when you first read this word you will react in some way. The word may capture your mind as it has mine, or you may reject it because you may think it is in bad taste. It all depends on what you think it means and what it reminds you of. The word has multiple meanings. It can mean “a sudden rush of intense emotion.” It can also mean “a reddening of the face or skin.” (At this point I assume you are either trying to guess the word or you have already read ahead to see what it is.) The word is used to describe things that have become even or square with one another. In slalom skiing it is “a consecutive series of vertical gates.” In the medical field it is used to describe procedures intended to cleanse wounds and clean debris. In the military and in hunting it is used to describe an action that chases the enemy or the wild game out of hiding. The word is used in card games to describe a certain winning hand. And in the bathroom, it is the action of using water to eliminate waste and replace it with clean water. Lord Jesus, I surrender my will to yours so that it is flush with your purpose. Lord Jesus, grant to me in moments of quietness and prayer a flush of your presence. Lord Jesus, cleanse the wounds of my heart with the Living Water so that there is no debris hindering the fullness of the Holy Spirit in me. Lord Jesus, flush the enemies of righteousness from hiding in my life that they may be exposed and taken captive by truth. Lord Jesus, flush from my mind all thoughts that you declare to be waste. Lord Jesus, may every step I take pass only through the flush you have prepared for me to direct me on the slopes of life. Now it’s in your head too, isn’t it? Today’s Text: Ecclesiastes 12:13 (ESV) The end of the matter; all has been heard. Fear God and keep his commandments, for this is the whole duty of man. 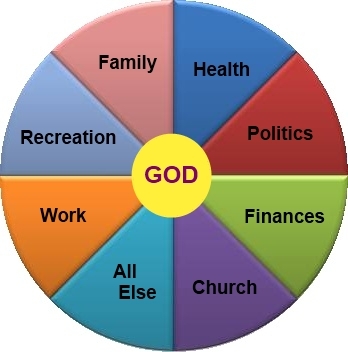 Nor is it to be a pie chart with God at the center under the assumption that suddenly all the other areas of my life will be brought into order, yet still giving me the right to wander in all of those areas as I see fit, somehow claiming that God now has blessed my wanderings. We have been deceived into believing that our lives will be better and more balanced by adding God to them. Nothing could be further from the truth of the Gospel. God never asked to be added to our lives. He has provided for our crucifixion with His Son Jesus, so that our life is cast aside and the life of Jesus Christ is born in us. We do not add God to what we have determined is the path of our lives, but rather we raise a white flag of surrender and place our lives fully into God through Jesus Christ. We are added to Him, not the other way around. F.B. Meyer wrote this in his devotional for today – It is only as we refuse to be conformed to this world, and yield ourselves to be transformed by the free entrance of the Holy Spirit into our minds, that we can learn all that God will do for us. We are nothing; He is all. And He is prepared to be and do all things in us, if only we will open to Him as the land lies open to the summer sun. When we begin to understand that we are to be found in Christ and that Christ is our life, then we will know what it is to love God and then love others as Christ did. The purpose of man is to discover the purpose of God for man, and Jesus stated it clearly when He said, Love the Lord your God with all your heart, your soul, your mind, and your strength; and love your neighbor as yourself. I can’t do that with God as just a part of my life. I can only do that when my life is lost in His. I’m taking a risk this morning as I write this. I’m not sure how many men actually read these devotionals, and yet today’s is directed at them. But ladies, there’s something in here for you too. After all, tomorrow is Valentine’s Day and giving love goes both ways. I came across this story as I was reading this morning. In 1997 Warner Brothers released a movie entitled Addicted to Love. While it’s not a family film, and I’m not advocating “R” rated movies, there’s a scene in this movie that illustrates the priority of love. The movie tells the story of a small-town astronomer by the name of Sam (Matthew Broderick) whose love for his girlfriend Linda (Kelly Preston) is deeply tested. Sam’s romantic love for Linda is illustrated early in the movie as we find him at work at the observatory. He has his telescoped trained on a star that is in the process of turning into a super nova. The amazing discovery is an obvious source of excitement for a visiting scientist. As the clock approaches high noon, one of Sam’s colleagues calls his attention to the time. Without explanation Sam turns the telescope away from the heavens and aims it at a school playground. The visiting scientist can’t believe that the clock or anything else on earth could be so important as to suspend the once-in-a-lifetime look at a super nova being born. Carl, one of Sam’s associates, tries to explain. “Professor, there’s this other phenomenon that Sam gives his priority to every morning,” Carl says. Sam, without skipping a beat, aims the telescope at a school playground several miles away. Through the telescope he sees Linda. In the midst of her responsibilities as a schoolteacher, she glances at her watch and then proceeds to look in the direction of the observatory. In what has become a practiced ritual, Linda smiles and waves. Men, there’s nothing – I MEAN NOTHING – more important every day than to make sure your wife knows that she is the priority of your life. When you turn the telescope of your heart from its consistent focus on the heart of God it should not seek to gaze upon anything in life before it captures a view of your wife. Do not begin the tasks of the day until you have taken her in your arms. Do not look at your career until she knows you care for her success more than your own. Never put wealth ahead of her well-being. Surrender your will to her wishes. Maybe the telescope of your life needs to be re-trained so it is primarily trained on your wife. She is God’s gift to you, and no matter what your pride wants you to believe, you don’t deserve her. Make sure she knows it! Today’s Text: Ephesians 6:4 (ESV) Fathers, do not provoke your children to anger, but bring them up in the discipline and instruction of the Lord. George Mallory was an English mountaineer who took part in the first three British expeditions to Mount Everest in the early 1920s. Mallory and his climbing partner both disappeared somewhere high on the North-East ridge during their attempt to make the first ascent of the world’s highest mountain. to the challenge of this mountain and goes out to meet it, that the struggle is the struggle of life itself upward and forever upward, then you won’t see why we go. What we get from this adventure is just sheer joy. And joy is, after all, the end of life. Here was a man who had wrong priorities, yet we call him a hero. Joy is not the highest objective of life. The priority of life is not to prove ourselves worthy to anyone. That priority is symptomatic of a deep need for identity and proof of personal value which will never be found in the pursuit of accomplishments but only in the pursuit of Jesus Christ. The result of such misaligned priorities is the loss of personal relationships as witnessed by Mallory’s son John. Whenever the priorities of life are determined by personal need or selfish ambition we will hurt the very ones we may be trying to impress. My priority will be others, not self.